UK Timber operates its own fleet of crane offload vehicles providing quality delivery service to all of its customers. Shipping charges that will be added automatically at the checkout are exclusively based on mileage (distance from our depot to delivery address) and not the quantity. Shipping cost will remain the same whether 10 sleepers or 50 are ordered. If you are looking for full loads you should either telephone or email for a quotation. The cranes have a reach of approximately 5 metres for the goods to be placed on the driveway or in a front garden where the area is accessible. Offloading over walls, fencing, hedges, etc. will be made at our drivers' discretion, if not then the delivery will be to the kerbside. Please see the map below for an approximate delivery fee. Please note all the fees provided are for guidance only, for a definite cost please use the calculator at checkout or contact us for further details. The customer is responsible for any delivery charges incurred due to them giving inaccurate information leading to problems with delivery, access, offloading or re-delivery or return charges. UK Timber does not accept liability for goods being undelivered due to poor accessibility or the buyer being unprepared for, or unable to offload the goods. UK Timber deliveries take up to 10 working days from the date of your completed order. Deliveries to Wales, Scotland and the Cornwall area can take up to 15 working days. * Due to excessive seasonal demand in April through to September, deliveries of timber can take up somewhat longer to arrive. As soon as we have a vehicle in your area your order will be scheduled and a call will be made to you the day before the delivery, this is to let you know when your order will be arriving so you can make sure someone is present. If we are unable to contact you, will leave a voicemail if possible. If you are unable to be present at the delivery, we can leave the goods on the driveway or where instructed and mail your invoice. We have a large fleet of dedicated vehicles fitted with a crane for offloading. The cranes have a reach of nearly 5 metres so can be placed on a driveway or in a front garden with little problem if the area is accessible with the crane (the driver will offload over small walls or fences at your risk, the drivers decision as to whether it is possible is final! ), if not then the delivery will be to the kerbside. All of UK Timber vehicles are between 18t and 28t, no smaller vehicles are available that can be requested for delivery. Couriers we use will deliver to the kerbside as a standard - courier is unable to deliver beyond the kerbside (e.g. into a property, or on to a driveway). Up to 45kg items will be sent out with Parcelforce or another courier and anything over 45kg will be wrapped on a burnable wooden pallet and delivered to the kerbside with a 7.5 tonne dustcart tail lift by Lombard Express courier. Please note that all products delivered by pallet courier will be delivered to the kerbside only and our courier will not bring products onto the property, bear this in mind when ordering our heavier items such as solid oak units and oak coffee tables as these will require several people to carry. Deliveries can take up to 7 working days to arrive from the date of processed payment. 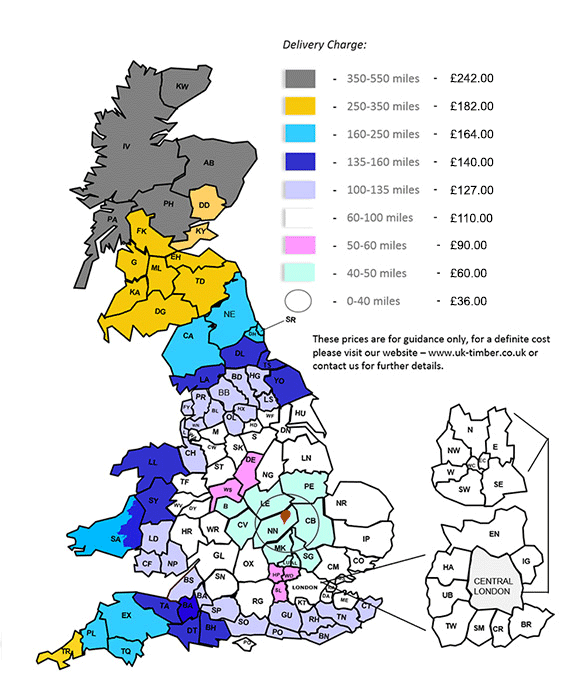 The courier will contact you by either telephone or email with approximate times for delivery. Please be aware, only products within these dimensions can be sent out with our courier, you are more than welcome to place your order for collection and arrange a courier of your own to pick it up. Any order that does not comply with these restrictions will be cancelled unless otherwise dealt with. Express delivery service is subject to availability of material and location. Free next day service applies to mainland UK excluding Devon, Cornwall and Scotland. Next day service to exclusion areas are still available at an additional charge, please contact our sales team on 01536 267107. If you have chosen to collect your order at checkout instead of receiving delivery, your order will typically be ready to collect from our premises in Corby within 5 working days. You will be notified as soon as your order is ready and the full collection address. Your order must be collected within a period of 4 weeks from completion of the checkout process, otherwise, the goods will be restocked and no refunds will be issued under such circumstances. In case of damage occurred offloading, all goods must be inspected and the driver should be notified immediately of any problems, and the delivery note signed accordingly. Unfortunately, we cannot guarantee to replace or repair any items you have purchased that have been signed for in good condition that are later found to be damaged. This does not affect your statutory rights as a consumer. In the case of missing items, damages or mistakes on the order, you must report it within 14 days from the day of receiving the goods. For any replacements or refunds to be approved by management photographic evidence must be provided. If we feel the situation cannot be improved by authorising another delivery for replacing goods delivered in a damaged state, we reserve all right to refund you in full and cancel the outstanding order. Any approved refunds will be issued within 7 days of the goods being returned. It takes 3-5 working days until the refund shows on customers account. As a customer of UK Timber, you will have the right to cancel any items purchased from us at any time before the goods are cut and despatched, or within seven days of receiving the goods. If you wish to cancel and return your order at a later date after the seven days following receipt of your goods, you will be prompted with a restocking charge of 25%. We reserve the right to charge you in respect of the initial delivery cost or later re-stocking of the goods. You will be responsible for returning the goods to us at your own cost and expected to take necessary precautions to prevent any damage in transit. We welcome you to return any goods via your own courier, or alternatively, we can offer you a collection and return service where a cost for return transport will be quoted upon request. If you would like to cancel your order, please email us at sales@uk-timber.co.uk or write to us at our address provided below. Goods must be returned in original condition and may not be returned after any form of treatment, cutting or alteration with anything including wood stain, wax, oil or preserver. Kerbside collection ONLY, the driver will not be loading goods from the back of the garden, from garages and will not be carrying goods from the house. The goods MUST be ready for collection prior to the arrival of our lorry, ie items placed on bearers or a pallet as initially delivered. If no one is present and the good are not left to be collected we reserve the right to charge you in respect of the initial delivery cost. Free delivery will be applied to your order automatically if you order exceeds £1600 (ex VAT). Offer only applies to orders placed online. UK Timber are please to offer all customers with a Birmingham postcode delivery at only £20 excluding VAT on any ordered placed online which will be automatically applied at checkout.